Re: Is my friend right?? "May is not a good time to do it." More accurate to say poor weather is not the time to do it. I have done it in May with friends on a beautiful sunny settled May day. Warm in Fort William, complete snow cover on the plateau, but perfectly ok to walk on with standard walking boots. I had fluked a week of decent weather, it only deteriorated the day before I went home. I would respectfully suggest that if you feel the need to put on crampons then that is the time to turn back. Out on the hill without training is not the place to use winter equipment for the first time. You don't know how to use the equipment, crampons may end up being more dangerous without practice than the alternative. By all means go for it but if you hit the snow line you need to seriously consider turning back. As the day goes on what was soft snow on the way up could be sheet ice on the way down. You also mention map and compass. Will you be teaching the kids how to navigate from A-B using map and compass or how to navigate dog legs without reference to the map, walking a bearing and measuring distance using pacing because the first one could get you killed. You made the right decision by asking advice on here first. If you are going up the tourist path and the weather is ok and there's no snow go for it. But that's unlikely the time you are going! Paul982 wrote: we dont have any experience at all. We live in the south, so I plan to teach them map skills using the new forest and train physically using Beacons hill. Still do this, as its a great skill to learn, and if the weather isn't right for Ben Nevis when you are up there, try a smaller hill, give them a taste for the hills so when you go back for the Ben they will be looking forward to it. For those who will know the highlands better than me in April, can you recommend some lower level peaks that will still be spectacular but less risky? What would Ben Lomond be like in April? Obviously subject to the snow conditions but a decent plan B? Sack the Juggler wrote: For those who will know the highlands better than me in April, can you recommend some lower level peaks that will still be spectacular but less risky? What would Ben Lomond be like in April? Obviously subject to the snow conditions but a decent plan B? Ben Lomond is a less serious proposition that Nevis, and will come into summer condition earlier in the Spring, but it is still not a trivial prospect in winter - the final section of the path is quite steep, gets buried and can certainly require crampons. The navigation is not without problems, either: there is a steep drop to the north near the summit, and it is possible to descend the north-east ridge by mistake in poor vis. If someone with no prior hill experience were really keen on an April trip to Scotland, my advice would be to research a range of possible walks at a variety of altitudes and make sensible and conservative choices based on the prevailing conditions (both snow and weather). Coming with any one fixed target of Munro height is a recipe for getting out of your depth. Give April a miss. 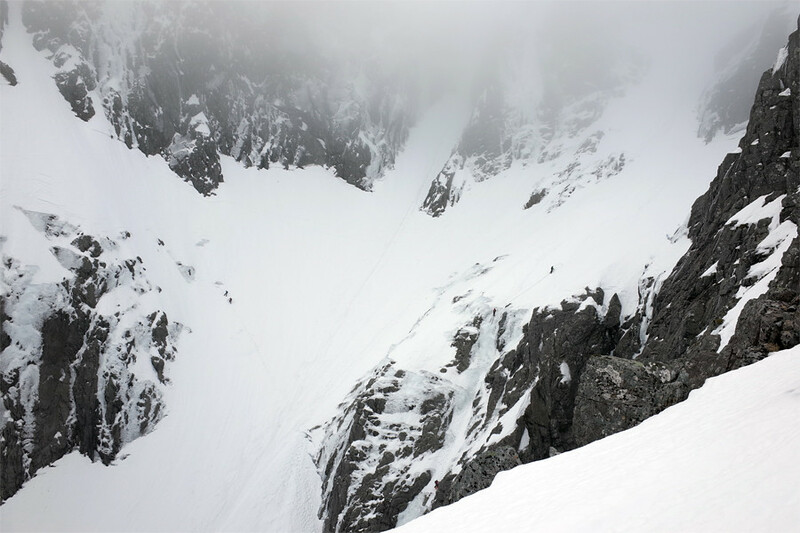 Here's a picture I took of Coire Leis in April 2016. OK this is the north side of the mountain but there will be tons of snow at the summit and for much of the upper parts of the tourist track too. Not ideal conditions if you're just starting out. In April I reckon Wales or Lakes a better bet. Come on Riverman...you can't really suggest the entire Scotland should be out of bounds? 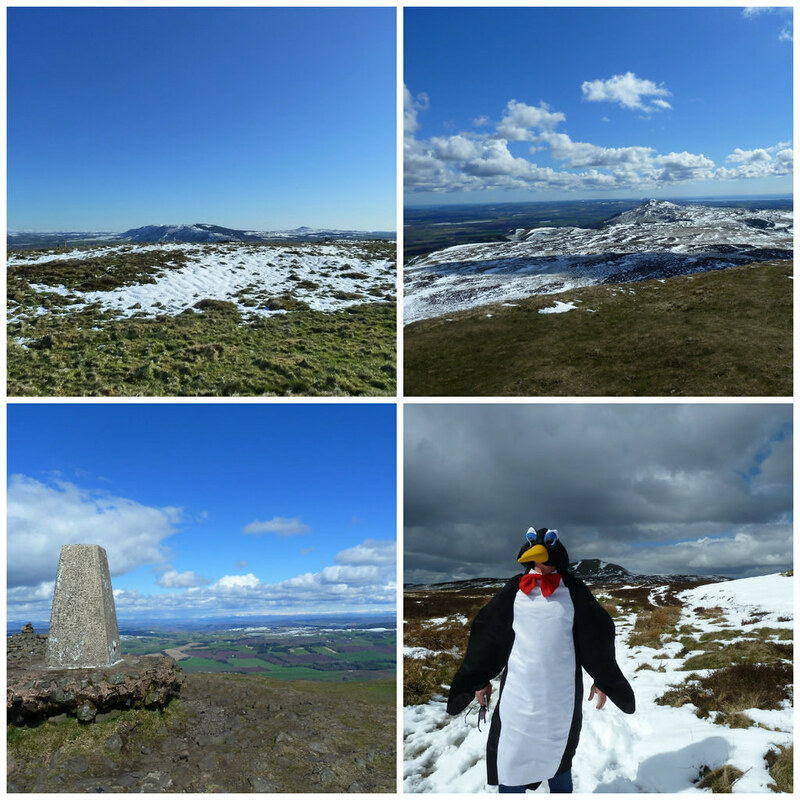 Though come to think of it I suppose even the West Lomond (522 m) in Fife did have snow when I did it in late April one year. Given that you're coming from the south of England, I'd suggest going to the Lake District or Snowdonia in April to gain a bit more experience somewhere further south where snow is less likely to be an issue. Having said that, the Galloway hills, Isle of Arran, Arrochar alps and Crianlarich hills are likely to be snow free by April so there are options if you want to come to Scotland. Please don't just do it because that's the dates you've chosen. I've climbed the Ben 3 times, all in good weather but theres always been snow at the top and it can be very scary and very dangerous. Yes, do it, but make sure you check weather conditions. If ANY doubt, cancel. What about trying some hills first? Ben Lomond for example, or any local to your home. Be safe. There have been recent fatalities on Nevis. May look beautiful, but we have to respect its dangerous beauty.